Shoepeg Corn Dish is absolutely delightful. 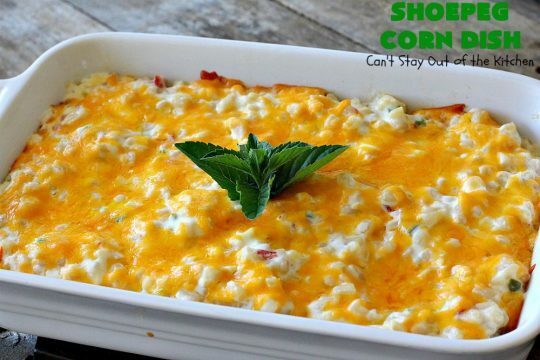 This lovely corn casserole combines corn in a creamy sauce made with cream cheese, butter and half-and-half. Then you stir in pimientos and finely diced jalapenos to give it a little kick. 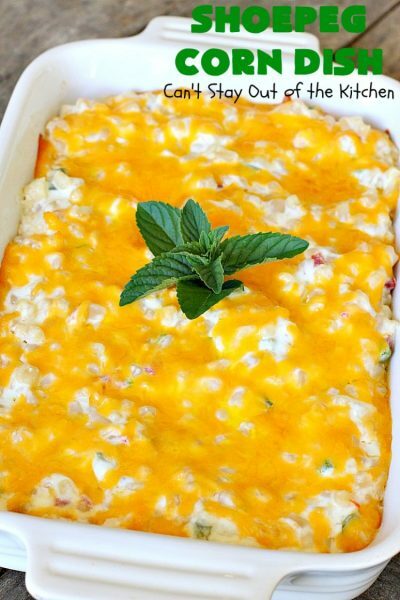 Cheddar cheese is sprinkled over top of the casserole before baking. 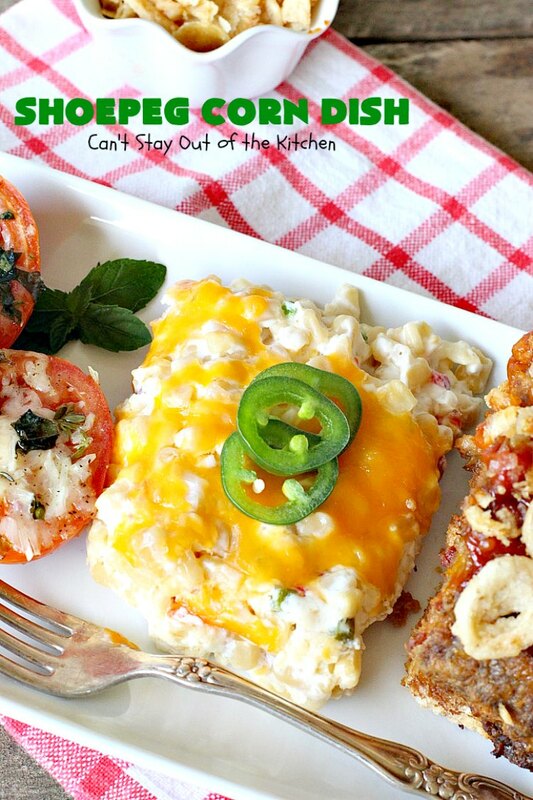 The end result is so mouthwatering you will want to serve it for every holiday dinner! Back in April we had dinner with some neighbors one street over from ours. They invited us over for a huge meal that included nine different items. I rarely cook nine different things for a meal so we felt like kings and queens. 🙂 Some of those recipes have become our favorites, like Amish Chicken and Noodles, Fried Green Beans, Baked Pineapple, Favorite Fruit Salad and Oreo Cookie Dessert. Linda shared her cookbook with me and I’ve been going through lots of those recipes and trying them out. Those recipes have been a treasure and I’ve really enjoyed making them. Shoepeg Corn Dish is one of Linda’s recipes. I served it for our Friday night care group in June. 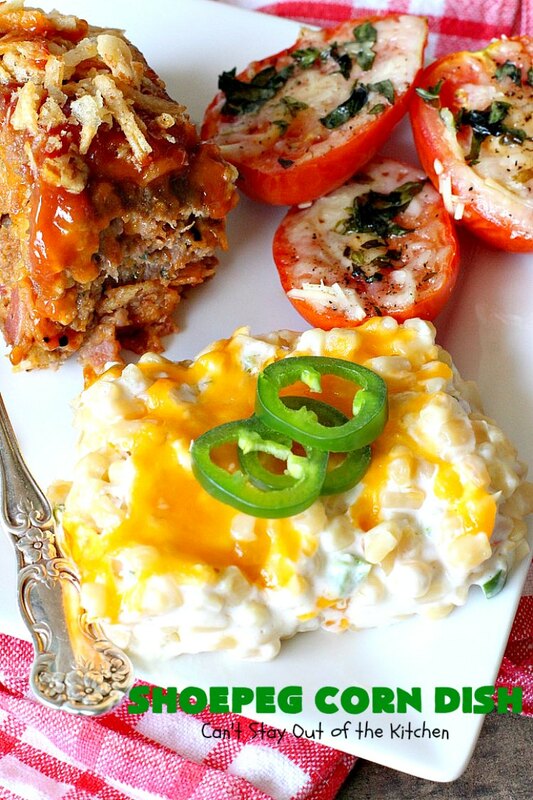 I also made Paula Deen’s Bacon Cheeseburger Meatloaf and Baked Parmesan Tomatoes. It was incredibly well received. 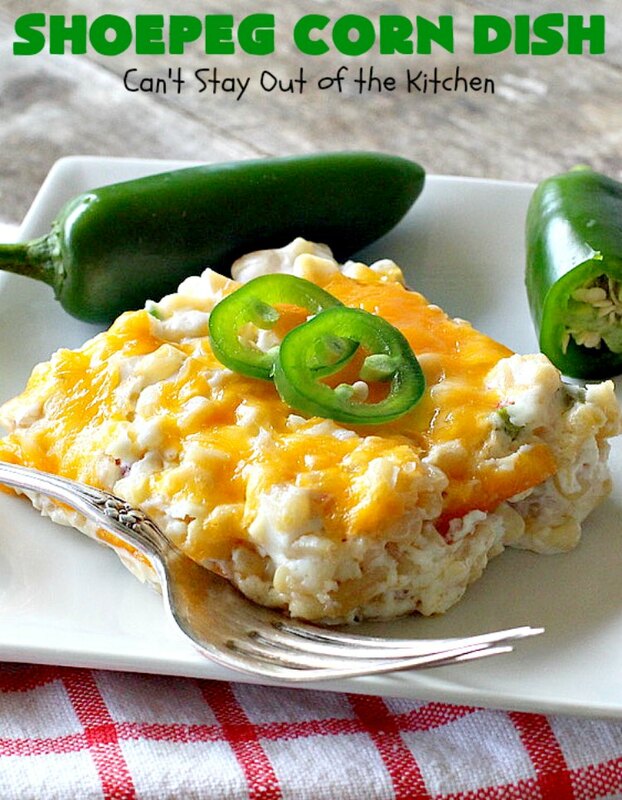 In fact, everyone loved this casserole. It has just the right amount of zip along with delicious creaminess to make this one of those easy go-to casseroles. One of the things I like about this dish is it’s really easy. If you need a side dish that has very few steps and is quick and easy to put together, this is it. 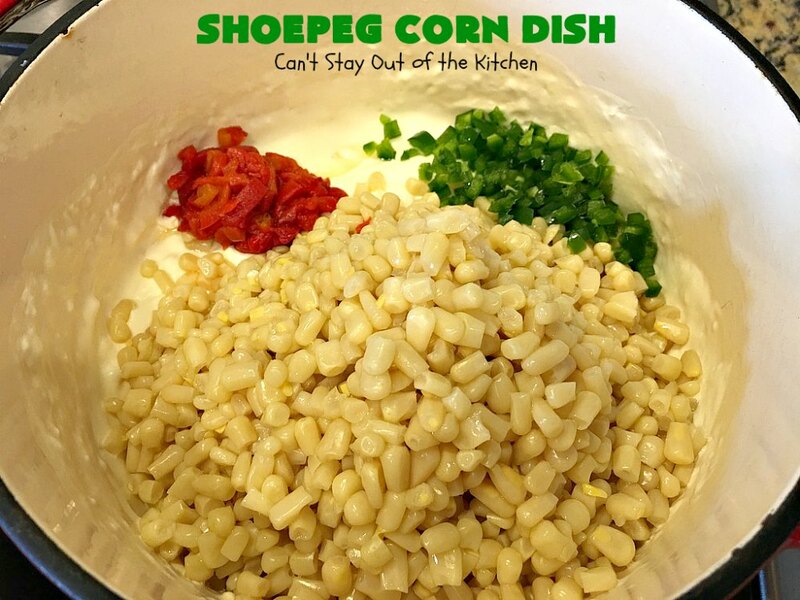 We loved Shoepeg Corn Dish and believe you will too. Shoepeg Corn Dish is one of the best corn casserole recipes, ever! The jalapenos provided just a touch of kick while the cream cheese cooled it down. 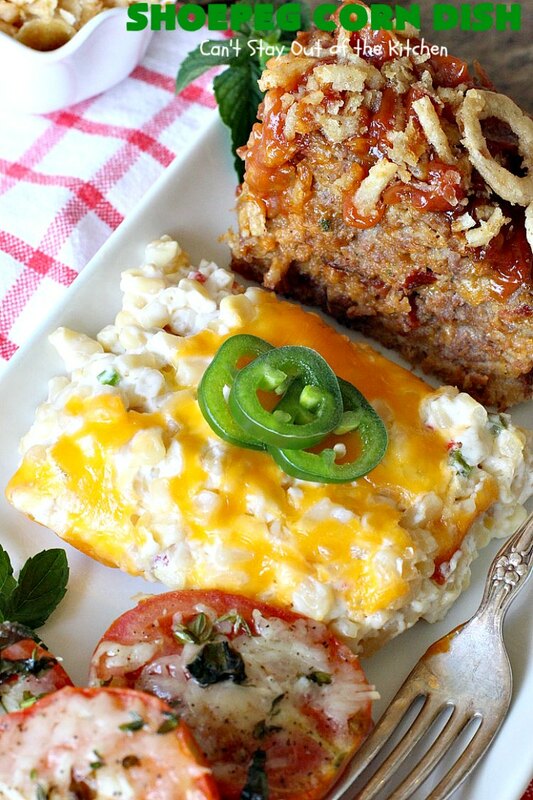 I served Shoepeg Corn Dish with Bacon Cheeseburger Meatloaf and Baked Parmesan Tomatoes. What a wonderful meal! 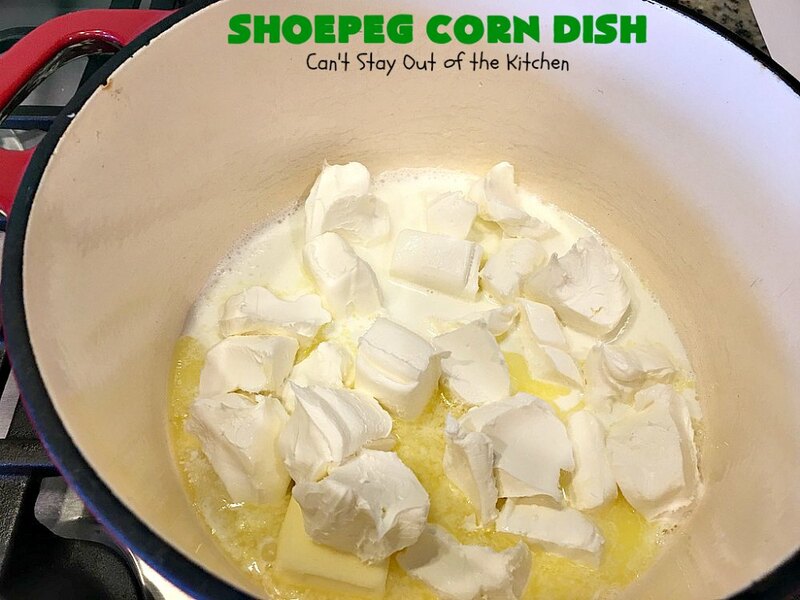 Place butter, half-and-half and cubed cream cheese in a medium skillet over low heat. 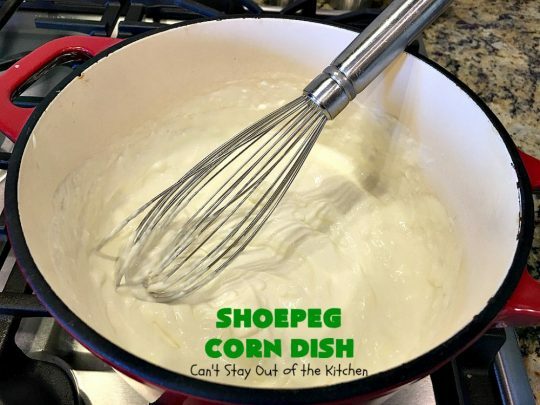 Whisk until ingredients are smooth and creamy. 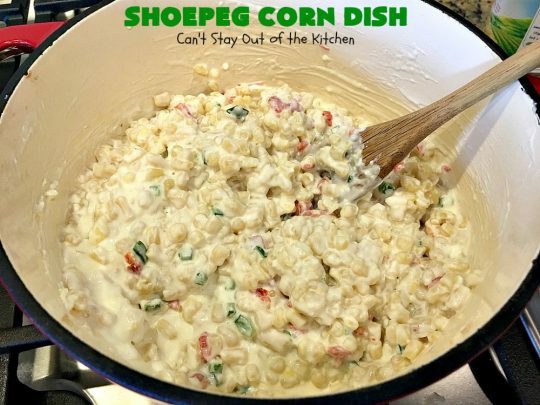 Add drained shoepeg corn, pimientos and finely diced and seeded jalapenos. 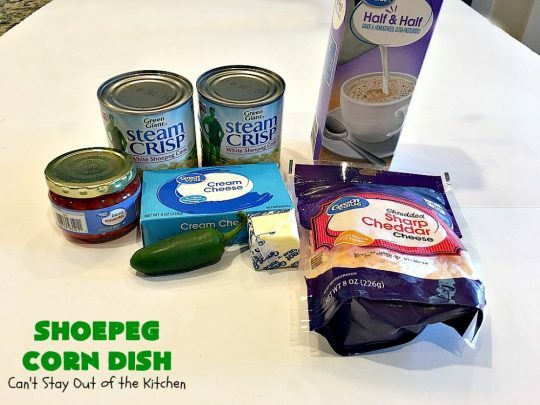 Place ingredients in a greased 8×12″ glass baking dish. Sprinkle cheddar cheese over top. Bake at 300 for about 20 minutes. This creamy casserole is wonderful. Our company loved it. 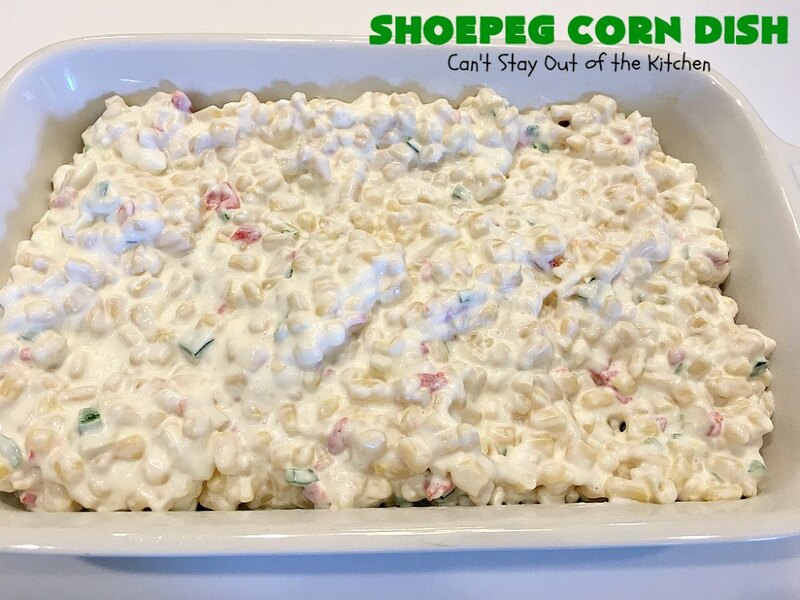 Shoepeg Corn Dish is a great side dish for holidays like Easter, Mother’s Day or Father’s Day. 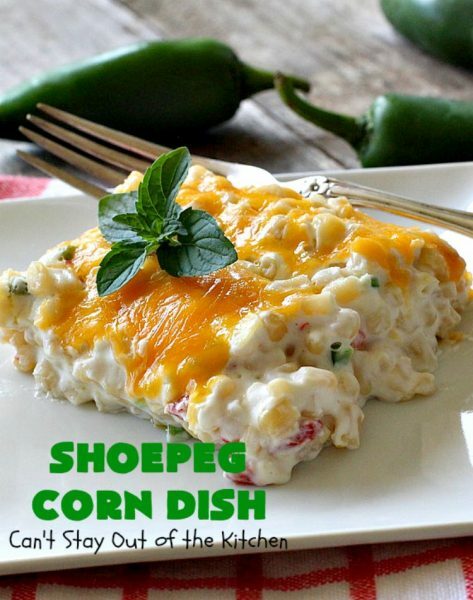 Shoepeg Corn Dish is mouthwatering. It has just enough kick to make it interesting. But not too much to overwhelm the dish. 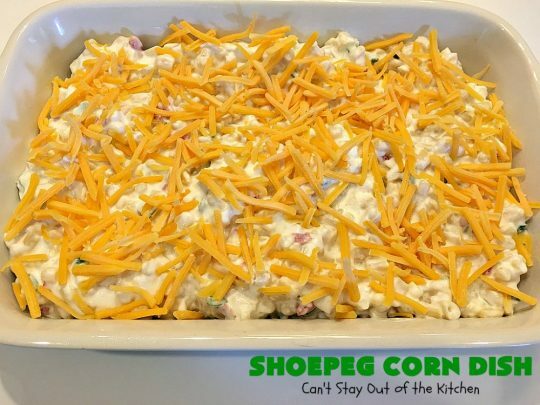 Shoepeg Corn Dish is extra creamy because it includes cream cheese and cheddar cheese. 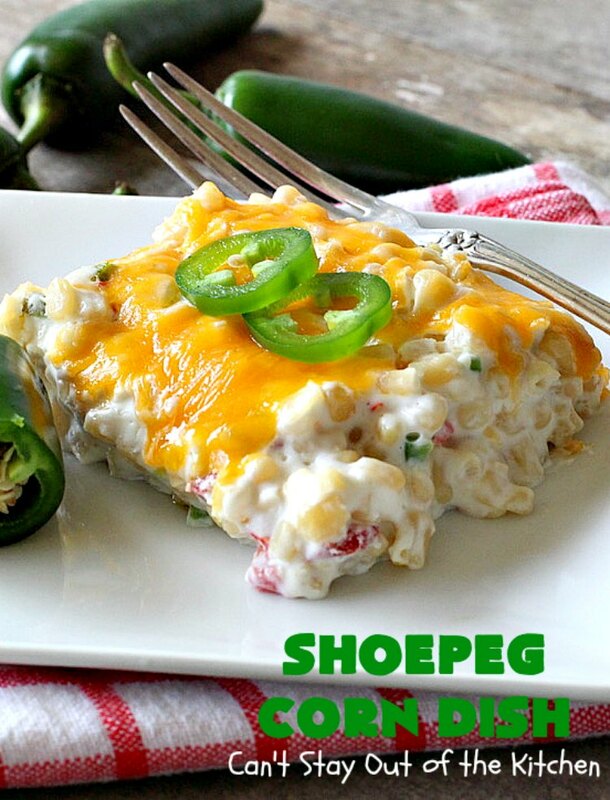 It gets the kick from jalapenos and pimientos. This wonderful side dish is perfect for any kind of holiday gathering. Gluten free. In a saucepan combine half-and-half or milk, butter and cream cheese over low heat. Do not cook—just melt the cheese. Fold in the corn, pimiento and jalapeno pepper. Pour into a greased 8x12” glass casserole dish. Shoepeg Corn Dish is delicious served with Bacon Cheeseburger Meatloaf and Baked Parmesan Tomatoes. 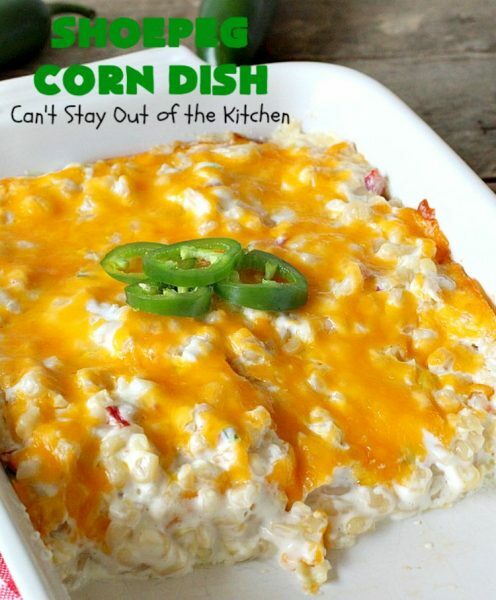 If you enjoy corn, you’ll love this amazing corn casserole.